I've been getting more adventurous in the kitchen over the last few weeks. Nothing especially fancy or difficult - just quite different for us. Chaz is getting braver in the 'lesbian food' department and I'm taking full advantage. We'd fallen into a habit of eating roast chicken for every other meal and I wanted to branch out and try something new before we completely od'd and never want to look at one ever again. 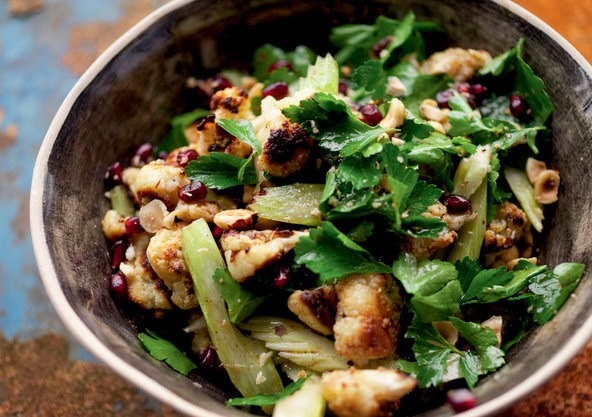 So, out came Jerusalem - the latest in my Ottolenghi library - and a load of cauliflowers. I wasn't aware of just how good cauliflowers are for us - apparently they're the most super of all the supers. Cancer fighting, anti oxidising, digestion helping, I could go on. Better than a blueberry dare I suggest. Roasted in the oven too, they are incredibly delicious. Not remotely related to the watery, bland, stinky way we ate them at school. The creation I want to share is one from said book but I didn't have all the ingredients so adapted it and it was still a sensation. I now make it as I did the first time. I used toasted pine nuts in the place of the hazelnuts and my dressing is a more simple concoction of olive oil, lemon, maple syrup and salt and pepper. Here is the proper Ottolenghi recipe. Roast the cauliflower by placing it on a parchment lined backing sheet, drizzle with 1-3 tablespoons of olive oil and toss it together with some salt and pepper. Roast in the oven for 25-35 minutes until parts of it are turning golden brown. Transfer to a large mixing bowl and set aside to cool down. In a small bowl, whisk together 2 tablespoons olive oil, sherry vinegar, maple syrup, cinnamon and allspice. Set aside.